In September 2014, CMLC’s vision for East Village took another huge stride forward with the sale of a quarter-acre (10,872 sq ft) lot along the newly redeveloped RiverWalk™ to Calgary’s XYC Design + Development. Today, vision is turning into reality with the project now underway after breaking ground in May 2018. 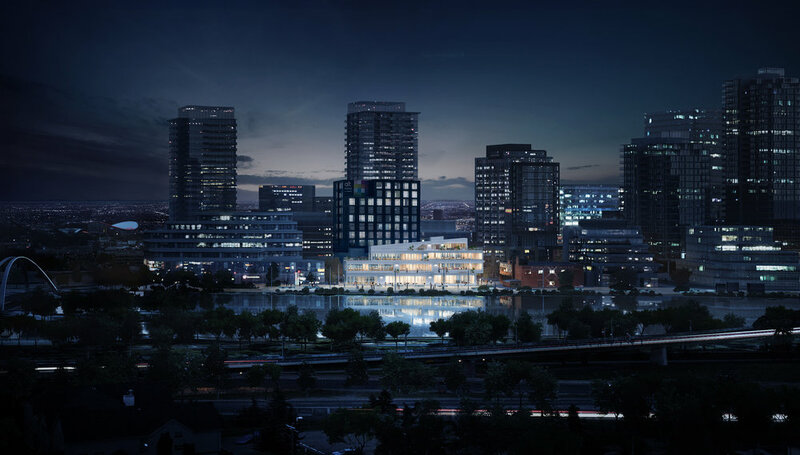 The prominent location immediately east of the historic Simmons Building is ideal for XYC’s planned development, which will yield between 17,000 and 20,000 sq ft of village-format retail and office space that fronts onto the Bow River. Restaurants on the main floor will spill out onto RiverWalk’s public promenade. The project represents an important step toward CMLC’s realization of the East Village retail strategy, which envisions a complementary mix of ‘village format’ retail and ‘urban format’ retail across a total commercial footprint of 440,000 sq ft.